Research supported by Asiahomes Internet. House hunting in February 2000. 2pm Meet at Hilton Hotel. Wants a place with garden, near the Chatsworth International School. Around $3,000. The regional manager, an Englishman wants a residence which must satisfy his family and the dog. He was used to the one-hour commuting to Heathrow Airport and in Singapore, Changi Airport is less than 20 minutes by commute from Holland Village. The 14-year old wants his privacy but dad says the father makes the decision. 3+1 1,550 sq. ft (excluding patio) $2,600 partially furnished. A 3-minute walk to the Toa Payoh subway. Very high ceiling, pentagon-shaped living dining and living area. Patio of around 200 sq. ft facing putting green and partly, tennis court. Landlord wanted $3,100 if fully furnished and she would give a furnishing allowance. She would keep the furniture. It is best for Landlords just to forget about keeping the furniture and motivate the prospect to take the place in this way. Be content with getting what you want, i.e. $2,600 partially furnished. The guard said there are many expats, but could not put a figure. Oleander Towers Condo has French expats as the French School is nearby and it is 4 subway stops to Orchard (around 5 minutes). Trellis Towers. Liked the landscaping and feel of this resort ambience. A 5-minute walk to the Toa Payoh subway. Will schedule some viewing. Oleander Towers look cramped when compared to Trellis Towers. Jalan Istimewa, off Holland Road, near to Cold Storage Jelita. White ceramic tiled flooring and window unit air conditioners. Cul de sac. 3+store+1 5,000 sq. ft land, 2,000 sq. ft built in, $4,000. Looks much better than the Jalan Istimewa semi-detached. 100% renovated, but still has window unit air conditioners. Manicured carpet grass garden seem to sell to this expat family who fell in love with this one-storey house. Yellow painted walls and bright daylight enters kitchen and rooms. Looks good and the garden is spacious for the dog. 3+1 2,000 sq. ft built in, $2,500. Agent was not around at 3.15 pm. Appointment cancelled. Apparently renovated from outside. Quiet street, but it will take at least 30 minutes to walk to the main Dunearn Road. Too far for the son to take public transport to the Chatsworth School. Robin Road 4+1 1,800 sq. ft land $4,500. 5-min drive to Orchard Road/Newton Road. The 14-year son just loved the attic room with attached bath. I expect him to like this house as the den gives him plenty of privacy. He was a quiet boy and this was one house he expressed his emotions. Living and separate dining area divided by an air well. A small grass patch in front and at the back.. Air well brings in natural daylight to the living area. Big patio off bedroom 2, big balcony off the master bedroom, long bath in master. 3 levels. 5-minute by taxi to the Chatsworth School or take a bus off Stevens Road. "Rather pricey," said the father but he had good rating for this house. Tulip Gardens 3+study beside roof terrace+1 3,000 sq. ft $3,900. White ceramic tiled flooring, maroon and green rectangular pads on mirrored wall off main door, big balcony facing Farrer Road and Waterfall Gardens condo in the distance. No traffic noise heard as block 9 is far in. Mini-mart, tennis court, gym and pool. No balcony on lower floor apartment. No patio as apartment is elevated above ground level. Maid's room sufficient for one mattress. Higher floors have lovely semi-circular balconies but no maid's room. 15-minute walk to Commonwealth subway. Living area - white ceramic tiles (not marble) with black diamond tiled areas at corners of tiles. Parquet flooring in bedroom. Master bedroom is at the back, green trees. Master bath has pink fiber glass counter top and white long bath. Kitchen has pink counter top. Washing machine and dryer in small utility area. 24-hour security, swimming pool, children's pool, tennis court, big gym, playground, covered car park, multi-purpose hall, 15-minute walk to Commonwealth subway. Expats love the big balconies. Olina Lodge 3+1 1,450 sq. ft $3,200 fully furnished. #01-06. View of corner of pool and privacy afforded by plants and flowers. A condo with expats will be ideal as the wife does not work. Ground floor will be best as the 10-year spaniel could just roam. The jovial husband complained that the dog gets more love than him or the son. However, he wanted a residence appropriate for his dog too. The English wives treat dogs like family and the English people are well known to be dog lovers. Given the choice, the son will like to live in the Robin Road house. A ground floor condo in an expat enclave near downtown, will most likely be the choice. As the husband will get a car, there is no need to live near a subway. 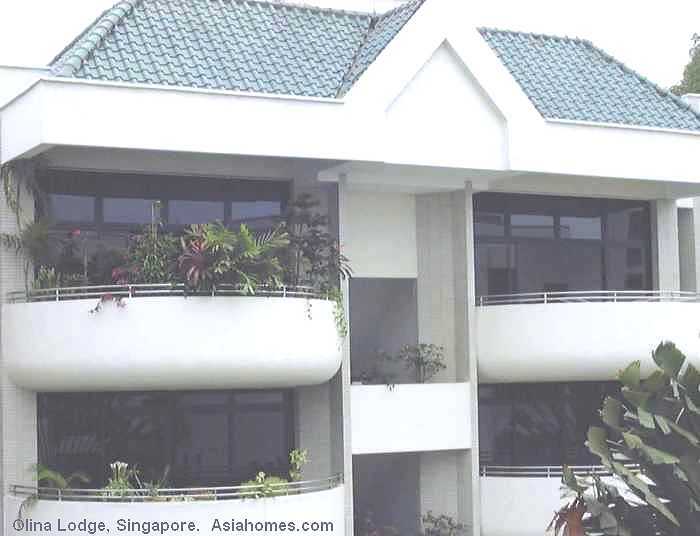 Expatriate decided to take Mandarin Gardens condo as there are many condo facilities. They regretted the decision as one neighbour had the habit of provoking their dog. Units mentioned above are for rent. For more information on any rental condos or FREE house-hunting for expats relocating to Singapore, email Judy Quek, tel: +65 9668 6468.